The term “Trust” is a common description of ownership, especially in real estate. If you or someone owns your residence in trust, what is the real meaning of the term? In general, a trust is a right in property held in a fiduciary relationship by one party for the benefit of another. When the assets are placed in the trust they belong to the trust itself and not the trustee. The trustee holds the title to the trust property, and the beneficiary is the person(s) who receives the benefits of the trust. A revocable or “living” trust is created during the lifetime of the trust maker. For legal purposes it can be changed or cancelled by decision of the trust creator, also known as “grantor”. The grantor transfers the title of the property to the trust, but retains as the initial trustee and can remove the property from the trust at anytime. 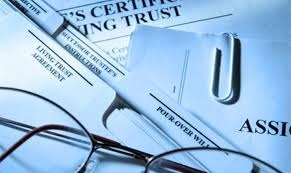 However the living trust can become irrevocable at the death of the grantor and the named trustees other than the grantor assume control of the trust activities. The trust has ownership over the assets after the trust maker’s death. Living trusts are commonly used to avoid probate of the estate assets. Another type of trust is an irrevocable trust. After it is created this type of trust cannot be altered, changed, or revoked. Trust property cannot be distributed out of the trust, except under the specific terms written into the trust by the grantor.\ trust maker. The benefit of this type of trust for estate assets is that it removes all incidents of ownership, effectively removing the trust’s assets from the grantor’s taxable estate. The grantor is also relieved of the tax liability on the income generated by the assets. Charitable trusts are trusts that are set up to benefit a particular charity or the public in general. Charitable trusts are often used as part of an estate plan to lower or avoid estate and gift tax. A charitable remainder trust is the most common charitable trust, which provides the donor with many tax benefits. First, you are allowed take a charitable income tax deduction and spread it over five years. The deduction is the original amount donated minus what you expect to receive in interest payments. Second, because the property is going to a charity upon your death, the property will not be included in your estate for estate tax purposes. Finally, it allows you to turn property that is not producing cash income into charitable tax deductions without paying capital gains taxes on the cumulative appreciation (increase in value). For example, if you donate stock that would have produced a huge capital gain, the charity will receive the benefit of the gross sale proceeds, and you will benefit from a charitable gift tax deduction.